Australia’s quest to regain the ISA Worlds team trophy it lost in Mexico has officially begun. This week, Surfing Australia hosted the Australian SUP Titles on Queensland’s Gold Coast, with the short course and distance races going down at the mecca of paddling known as Currumbin. There’s probably a higher concentration of paddling talent in Australia than any other nation, so the country’s national titles generally attract a more competitive field than many international events around the world. And while a few of the big names were missing this week, the start line still looked pretty solid. The new Australian Champion in the marathon race is Michael Booth, who claimed a narrow win ahead of the highly under-rated James Casey, while Terrene Black triumphed in the women’s. Saluting in the waves were Lincoln Dews and Karla Gilbert, with 2015 Team Australia representatives Toby Cracknell and Terrene the men’s and women’s runners-up respectively. In tricky conditions on Wednesday (see the video below), Lincoln held off a small but very strong field to claim the national title in the surf racing event. With Toby taking second place, the boys reversed their 1-2 result from 12 months ago, when Toby snatched the national title from Lincoln in similarly-challenging conditions. And in an amazing coincidence, Toby defeated Lincoln by 18 seconds last year, while Linc got the better of Tobes by 19 seconds this time around. Former IronWoman Queen Karla was too strong in the surf, crossing the line three minutes ahead of Terrene to claim a third-straight national title in the surf race. On Thursday (yes, the titles were held mid-week) it was the distance, or “Marathon” race, with a great course being set from Snapper Rocks on the southern end of the Gold Coast (home to the Quiksilver Pro surf contest) running north to Currumbin. The 20km trek started in the ocean and finished in the protected Currumbin Creek, with the final stretch of flat water playing a key role in deciding the overall champ. 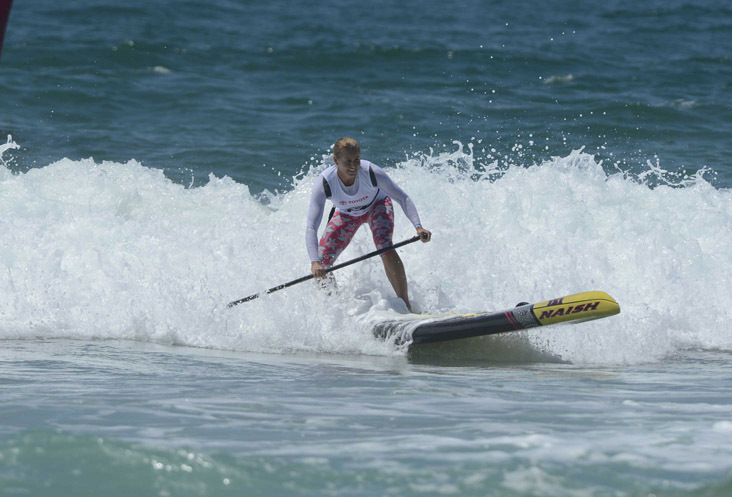 After having led for most of the ocean leg, Booth made a slight mistake coming in through the surf at Currumbin Alley, which allowed James and Toby to catch up for the final, 1.5km sprint to the line. Jimmy and Boothy stayed together until the final 500 metres, when the latter put in a surge and opened up a four board length gap that stayed in place til the finish. It’s been a big week for the new Australian Champion: Booth was the surprise packet at #PPG2015, sticking with Danny Ching and Travis Grant during one of the fastest long distance races we’ve ever seen, before surviving most of the carnage in the chaotic surf race for a very solid overall result in the biggest race of the year. Boothy’s strong recent showings will surely give the Starboard team rider the unofficial/official title of “World’s #1 Dark Horse” next season. That season looks set to include a trip to the 5th annual ISA Worlds, with the respective race winners at the Aussies earning automatic qualification for Team Australia. Special mention goes to my old sparring partner Steve “Wild Man” Walker, who took out the over 40s national title and came home top 10 overall. Looks like it was a great event on the Gold Coast, though unfortunately the poor choice of dates made for less than ideal preparation for many of the top contenders. 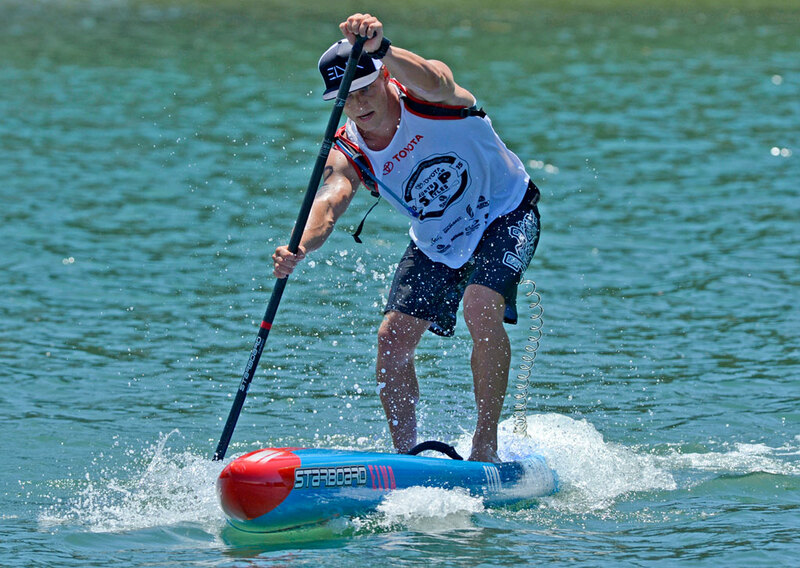 Aussie competitors at the Pacific Paddle Games had to rush home from California on Sunday night in order to compete at the nationals, which left many of them sore and tired on the start line. Didn’t seem to bother Boothy, though several guys did comment on being too exhausted to compete at their best this week (while a couple of big names, including Jake Jensen and Travis Grant, had to miss the event entirely). But anyway, looking ahead to 2016, who will be representing the Green & Gold as they seek to get one back on the Stars & Stripes? While the new Australian Champions all receive an automatic invitation, the rest of the team is up for debate. There is room in the Surfing Australia rule book to select wildcards to fill the second men’s spot in each race, which could come into play given that a few of the big names were missing this week. Considering his world-beating form all season, you’d be a brave selector to overlook Travis Grant. Not only is he the highest-ranked and best-performing Aussie of 2015, he was also Australia’s first ever ISA SUP gold medalist way back in 2012. If Australia wants to reclaim its title next year, Travis needs to be there. Given his runner-up finish in the course race and third-place in the distance (and the fact he represented Team Oz the past two years), I’d look at Toby Cracknell as the first alternate, and possibly an automatic inclusion in the course race if Surfing Oz only give Travis a wildcard into the distance race. You’d also say that Kelly Margetts should get a definite look in given his amazing form this year (he’s currently ranked #8 in the world), however I doubt Surfing Australia will award more than one wildcard spot. If Karla doesn’t accept her invite for the course race, which is a possibility given she’s a full-time mum and the ISA Worlds are a two-week commitment, logic would dictate that Terrene doubles up in both the short course and long distance events, as she did quite successfully in Sayulita. But tactically I’d actually give that spot to Shakira Westdorp, who is one of the best in the world at racing in the waves but was not allowed to compete this week after she missed the state titles race. Shak will already be at the 2016 Worlds after having won the National SUP Surfing Title last weekend (Jackson Close won the men’s), and having two female racers also allows each one to save their energy and focus on their one specialty event, rather than tiring themselves out over two races. There’s also the genuine possibility of the ISA increasing the women’s representation to be in line with the men’s, which would allow two women from each country in each event. The Olympic movement strongly favours equal gender participation, so it seems inevitable the ISA Worlds will have the same amount of male and female athletes before too long. Whether or not that happens in time for 2016 remains to be seen. Anyway I’m sure we’ll have an official team announcement later in the year. Though considering the location/dates/format of the 2016 Worlds haven’t even been released by the ISA yet, don’t expect the national teams to figure out their final squads any time soon. 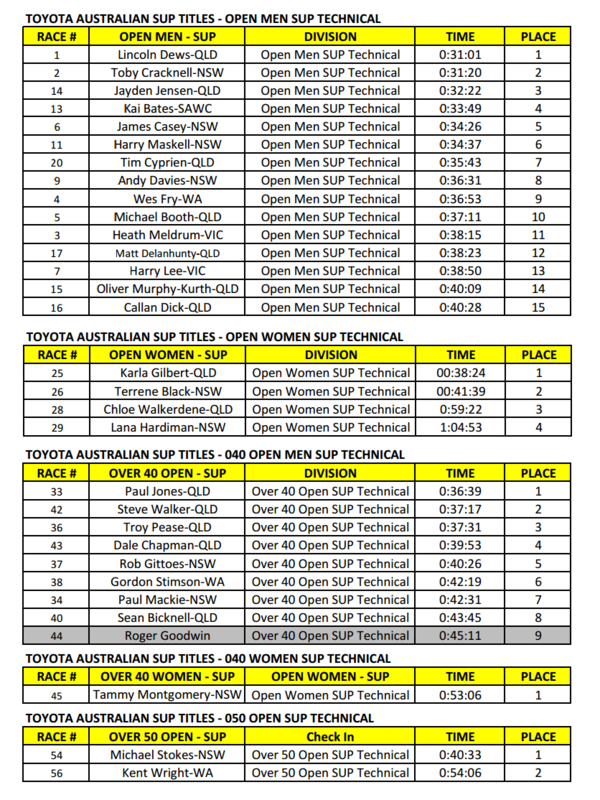 In the meantime you can scroll down past the recap vids for full results from the 2015 Australian SUP Titles.